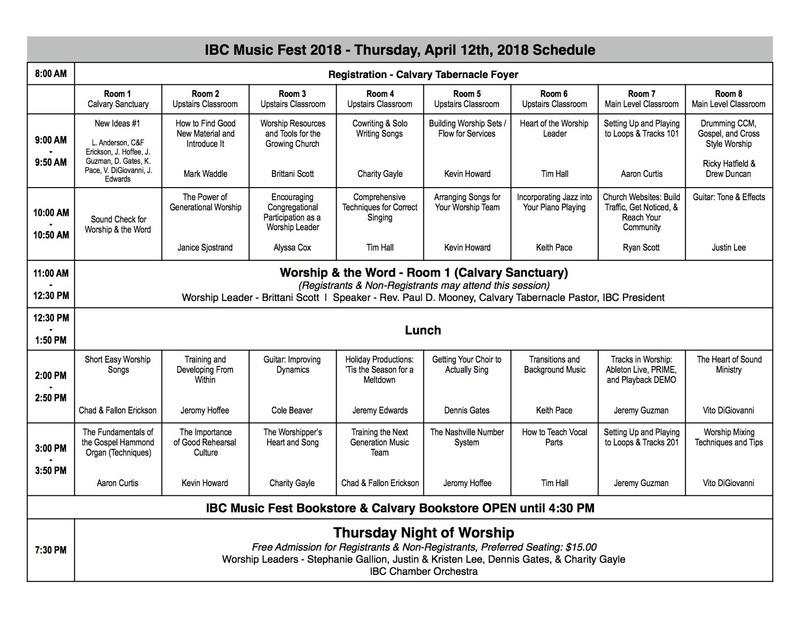 Mark your calendar for IBC Music Fest 2018, April 11-13, 2018! 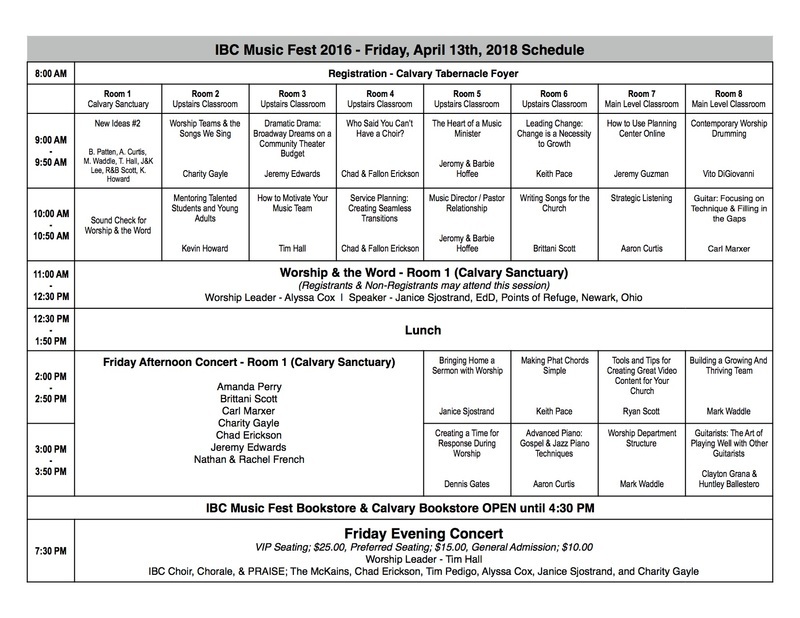 Indiana Bible College Music Festival began twenty-two years ago as a one-day seminar conducted by Dr. Lindel M. Anderson during his first year as IBC's Dean of Worship Studies. Music Fest is a ministry of Indiana Bible College and is hosted by Calvary Tabernacle in Indianapolis, Indiana. The conference is designed to challenge and inspire those involved in church music and worship arts ministries. The teaching staff includes some of the most outstanding music ministers, directors, musicians, songwriters, recording artists, etc. in the Apostolic movement. Our goal is to continue expanding the scope of the conference, introducing new classes and clinicians, and making Music Fest an even better and more resourceful experience. Want to be assured a prime seat for the evening concerts? Back by popular demand. Limited Preferred seating is available! So hurry and get yours today. 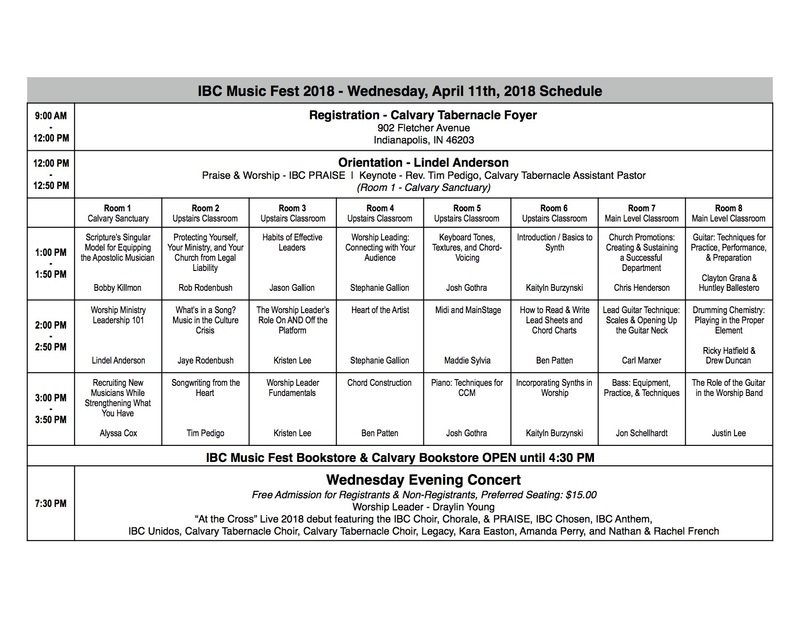 *IBC Music Fest Registrants will receive a discount code worth $10, after submitting their registration towards the purchase of evening concert tickets. The code is sent in the welcome/receipt email after your registration has been submitted. We recommend that you use Hotwire.com or Priceline.com for hotel reservations. The closest locations are in downtown Indianapolis, but keep in mind that you will probably have to pay for parking at a downtown hotel. The next closest area is the South Indianapolis hotels but sometimes you can get better deals in the airport area.